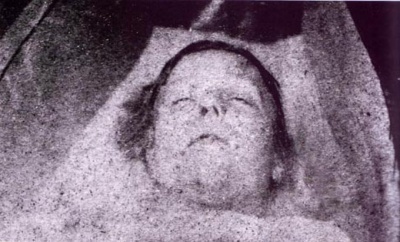 Mortuary photograph of Mary Ann Nichols. Born Mary Ann Walker on August 26, 1845 in Dawes Court, Shoe Lane, off Fleet Street. She was christened in or some years before 1851. 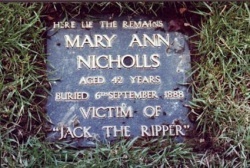 At the time of her death the East London Observer guessed her age at 30-35. At the inquest her father said "she was nearly 44 years of age, but it must be owned that she looked ten years younger." 5'2" tall; brown eyes; dark complexion; brown hair turning grey; five front teeth missing (Rumbelow); two bottom-one top front (Fido), her teeth are slightly discoloured. She is described as having small, delicate features with high cheekbones and grey eyes. She has a small scar on her forehead from a childhood injury. She is described by Emily Holland as "a very clean woman who always seemed to keep to herself." The doctor at the post mortem remarked on the cleanliness of her thighs. She is also an alcoholic. Father: Edward Walker (Blacksmith, formerly a locksmith). He has gray hair and beard and, as a smithy, was probably powerfully built. At the time of Polly's death he is living at 16 Maidswood Rd., Camberwell. Polly married William Nichols on January 16, 1864. She would have been about 22 years old. The marriage is performed by Charles Marshall, Vicar of Saint Bride's Parish Church and witnessed by Seth George Havelly and Sarah Good. William Nichols is in the employ of Messrs. Perkins, Bacon & Co., Whitefriars Rd. and living at Cogburg Rd. off Old Kent Road at the time of his wife's death. The couple have five children. Edward John, born 1866; Percy George, 1868; Alice Esther, 1870; Eliza Sarah, 1877 and Henry Alfred born in 1879. The oldest, 21 in 1888, is living with his grandfather (Polly's father) at the time of her death. He had left home in 1880 according to his father, on his own accord. The other children continued to live with Nichols. William and Polly briefly lodged in Bouverie Street then moved in with her father at 131 Trafalgar Street for about ten years. They spend six years, (no dates) at No. 6 D block, Peabody Buildings, Stamford Street, Blackfriars Rd. There they are paying a rent of 5 shillings, 6 pence per week. If Peabody Buildings is their last address then they would have lived there from 1875-1881, with her father from 1865 to 1875. Polly separated from Nichols for the final time in 1881. It was the last of many separations during 24 years of marriage. In 1882, William found out that his wife was living as a prostitute and discontinued support payments to her. (Sugden: she is living with another man, probably Thomas Dew). Parish authorities tried to collect maintenance money from him. He countered that she had deserted him leaving him with the children. He won his case after establishing that she was living as a common prostitute. At the time of her death, he had not seen his wife in three years. Polly's father spread the story that the separation had come about due to William having an affair with the nurse who took care of Polly during her last confinement. William does not deny that he had an affair but states that it was not the cause of her leaving. "The woman left me four or five times, if not six." He claims that the affair took place after Polly left. There is obvious disharmony in the family as the eldest son would have nothing to do with his father at his mother's funeral. After the separation, Polly begins a sad litany of moving from workhouse to workhouse. 3/24/83-5/21/83 -- She is living with her father in Camberwell. He testifies at the inquest into her death that she was "a dissolute character and drunkard whom he knew would come to a bad end." He found her not a sober person but not in the habit of staying out late at night. Her drinking caused friction and they argued. He claims that he had not thrown her out but she left the next morning. 6/2/83-10/26/87 -- She is said to have been living with a man named Thomas Dew, a blacksmith, with a shop in York Mews, 15 York St., Walworth. In June 1886 she had attended the funeral of her brother who had been burned to death by the explosion of a paraffin lamp. It was remarked by the family that she was respectably dressed. 10/25/87 -- She spends one day in St. Giles Workhouse, Endell Street. On 12/2/87 It is said that she was caught "sleeping rough (in the open)" in Trafalgar Square. She was found to be destitute and with no means of sustenance and was sent on to Lambeth Workhouse. 1/4/88-4/16/88 -- Mitcham Workhouse, Holborn and Holborn Infirmary. 4/16/88-5/12/88 -- Lambeth Workhouse. It is in Lambeth Workhouse that she meets Mary Ann Monk who will eventually identify Polly's body for the police. Monk is described as a young woman with a "Haughty air and flushed face." Polly has another friend in the Lambeth Workhouse, a Mrs. Scorer. She had been separated from her husband James Scorer, an assistant salesman in Spitalfields Market, for eleven years. He claimed that he knew Polly by sight but was unable to identify the body at the mortuary. On 12 May she left Lambeth to take a position as a domestic servant in the home of Samuel and Sarah Cowdry. This was common practice at the time for Workhouses to find domestic employment for female inmates. The Cowdry's live at "Ingleside", Rose Hill Rd, Wandsworth. Samuel (b. 1827)is the Clerk of Works in the Police Department. Sarah is one year younger than her husband. They are described as upright people. Both are religious and both are teetotalers. "I just right to say you will be glad to know that I am settled in my new place, and going all right up to now. My people went out yesterday and have not returned, so I am left in charge. It is a grand place inside, with trees and gardens back and front. All has been newly done up. They are teetotalers and religious so I ought to get on. They are very nice people, and I have not too much to do. I hope you are all right and the boy has work. So good bye for the present. Answer soon, please, and let me know how you are." Walker replies to the letter but does not hear back. She works for two months and then left while stealing clothing worth three pounds, ten shillings. Wilmott's Lodging House at 18 Thrawl Street, Spitalfields. There she shares a room with four women including Emily Holland. The room is described as being surprisingly neat. The price of the room is 4d per night. On 8/24/88 Polly moves to a lodging house known as the White House at 56 Flower and Dean Street. In this doss-house men are allowed to share a bed with a woman. Heavy rains have ushered out one of the coldest and wettest summers on record. On the night of August 30, the rain was sharp and frequent and was accompanied by peals of thunder and flashes of lightning. the sky on that night was turned red by the occasion of two dock fires. 11:00 PM -- Polly is seen walking down Whitechapel Road, she is probably soliciting trade. 12:30 AM -- She is seen leaving the Frying Pan Public House at the corner of Brick Lane and Thrawl Street. She returns to the lodging house at 18 Thrawl Street. 1:20 or 1:40 AM -- She is told by the deputy to leave the kitchen of the lodging house because she could not produce her doss money. Polly, on leaving, asks him to save a bed for her. " Never Mind!" She says, "I'll soon get my doss money. See what a jolly bonnet I've got now." She indicates a little black bonnet which no one had seen before. 2:30 AM -- She meets Emily Holland, who was returning from watching the Shadwell Dry Dock fire, outside of a grocer's shop on the corner of Whitechapel Road and Osborn Street. Polly had come down Osborn Street. Holland describes her as "very drunk and staggered against the wall." Holland calls attention to the church clock striking 2:30. Polly tells Emily that she had had her doss money three times that day and had drunk it away. She says she will return to Flower and Dean Street where she could share a bed with a man after one more attempt to find trade. "I've had my doss money three times today and spent it." She says, "It won't be long before I'm back." The two women talk for seven or eight minutes. Polly leaves walking east down Whitechapel Road. 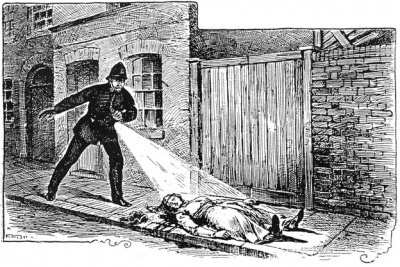 PC Neil discovers Nichols' body in Buck's Row, from Famous Crimes Past and Present, 1903. 3:15 AM -- PC John Thain, 96J, passes down Buck's Row on his beat. He sees nothing unusual. At approximately the same time Sgt. Kerby passes down Buck's Row and reports the same. 3:40 or 3:45 AM -- Polly Nichols' body is discovered in Buck's Row by Charles Cross, a carman, on his way to work at Pickfords in the City Road., and Robert Paul who joins him at his request. "Come and look over here, there's a woman." Cross calls to Paul. Cross believes she is dead. Her hands and face are cold but the arms above the elbow and legs are still warm. Paul believes he feels a faint heartbeat. "I think she's breathing," he says "but it is little if she is." The two men agree that they do not want to be late for work and after arranging Nichols' skirts to give her some decency, decide to alert the first police officer they meet on their way. They eventually meet PC Jonas Mizen at the junction of Hanbury Street and Baker's Row and tell him of their find. In the meantime, Nichols' body has been found by PC John Neil, 97J. He signals to PC Thain who then joins him and the two are soon joined by Mizen. Thain calls for Dr. Rees Ralph Llewellyn, who resides nearby. The two return a few minutes later (around 3:50 A.M.) and Dr. Llewellyn pronounces life to have been extinct "but a few minutes." Buck's Row is ten minutes walk from Osborn Street. The only illumination is from a single gas lamp at the far end of the street. Polly's body is found across from Essex Wharf and the Brown and Eagle Wool Warehouse and Schneiders Cap Factory in a gateway entrance to Brown's stableyard between a board school (to the west) and terrace houses (cottages) belonging to better class tradesmen. She is almost underneath the window of Mrs. Emma Green, a light sleeper, who lives in the first house next to the stable gates. Her house is called the 'New Cottage'. She is a widower with two sons and a daughter living with her. That night, one son goes to bed at 9:00 PM, the other follows at 9:45. Mrs. Green and her daughter shared a first floor room at the front of the house. They went to bed at approximately 11:00 PM. She claims she slept undisturbed by any unusual sound until she was awakened by the police. Opposite New Cottage lives Walter Purkiss, the manager of Essex Wharf with his wife, children and a servant. He and his wife went to bed at 11:00 and 11:15 respectively. Both claimed to have been awake at various times in the night and heard nothing. 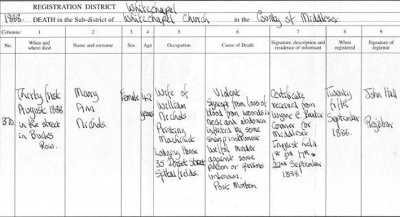 Polly Nichols' body is identified by Lambeth Workhouse inmate Mary Ann Monk and the identification confirmed by William Nichols. Reddish brown ulster with seven large brass buttons bearing the pattern of a woman on horseback accompanied by a man. Two petticoats, one gray wool, one flannel. Both stenciled on bands "Lambeth Workhouse"
Observations of Dr. Rees Ralph Llewellyn upon arrival at Bucks row at 4:00 AM on the morning of August 31st. After only a brief examination of the body he pronounced Polly Nichols dead. He noted that there was a wine glass and a half of blood in the gutter at her side but claimed that he had no doubt that she had been killed where she lay. "Five teeth were missing, and there was a slight laceration of the tongue. There was a bruise running along the lower part of the jaw on the right side of the face. That might have been caused by a blow from a fist or pressure from a thumb. There was a circular bruise on the left side of the face which also might have been inflicted by the pressure of the fingers. On the left side of the neck, about 1 in. below the jaw, there was an incision about 4 in. in length, and ran from a point immediately below the ear. On the same side, but an inch below, and commencing about 1 in. in front of it, was a circular incision, which terminated at a point about 3 in. below the right jaw. That incision completely severed all the tissues down to the vertebrae. The large vessels of the neck on both sides were severed. The incision was about 8 in. in length. the cuts must have been caused by a long-bladed knife, moderately sharp, and used with great violence. No blood was found on the breast, either of the body or the clothes. There were no injuries about the body until just about the lower part of the abdomen. Two or three inches from the left side was a wound running in a jagged manner. The wound was a very deep one, and the tissues were cut through. There were several incisions running across the abdomen. There were three or four similar cuts running downwards, on the right side, all of which had been caused by a knife which had been used violently and downwards. the injuries were form left to right and might have been done by a left handed person. All the injuries had been caused by the same instrument." With all of her faults Nichols seems to have been well-liked by all who knew her. At the inquest her father says, "I don't think she had any enemies, she was too good for that." Mary Ann "Polly" Nichols was buried on Thursday, 6 September, 1888. That afternoon, Polly was transported in a polished elm coffin to Mr Henry Smith, Hanbury Street undertaker. The cortege consisted of the hearse and two mourning coaches, which carried Edward Walker, William Nichols, and Edward John Nichols. Polly was buried at City of London Cemetery (Little Ilford) at Manor Park Cemetery, Sebert Road, Forest Gate, London, E12, (public) grave 210752 (on the edge of the current Memorial Garden). The funeral expenses were paid for by Edward Walker (Polly's father), William Nichols (Polly's ex-husband), and Edward John Nichols (Polly's son). In late 1996, the cemetery authorities decided to mark Polly's grave with a plaque. Death certificate of Mary Ann Nichols.